One of the many interesting animals of the temperate rainforest is the North American River Otter. This semiaquatic mammal is also called Northern River Otter or Common Otter and it is as comfortable on land as it is in the water. Below you will find a list of facts and information about this amazing species including what adaptations have helped it survive. This information is wrirtten for both kids and adults. Click here for a great selection of Amazon.com books about North American River Otters. 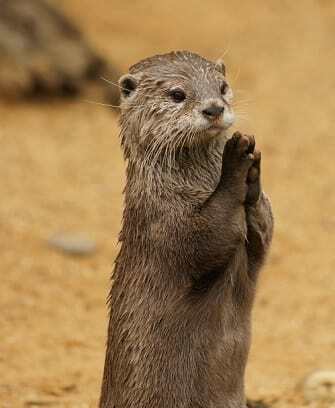 Its scientific name is Lontra canadensis. North American River Otters are very playful creatures; this is why they are a favorite attraction for kids at zoos where they can often be observed playing games. This animal can stay submerged for over seven minutes and dive to an amazing depth of sixty feet. While underwater it closes its nostrils and ears to keep water out. This animals diet consist mostly of fish; however they are opportunist and will eat many other foods including oysters, shellfish, crabs, frogs, crayfish, rodents, turtles, and insects. Their habitat includes rivers, swamps, streams, lakes, and along the shores throughout the United States and Canada. This otter builds a burrow very close to the water with many openings. Usually at least one of the openings is directly into a body of water. The number of River Otters throughout North America, including the temperate rain forest, has seen a steady decline that started when European settlers first arrived in North America. Hunting, habitat loss, and pollution have all contributed to its decreasing numbers. They are however not in danger of extinction (at least in the near future). In 1777 a German naturalist by the name of Johann Christian Daniel Von Schreber was the first person to describe the North American River Otter. As far as predators in the temperate rainforest go this animal is much safer in the water where very few predators can reach it. On land there are numerous animals the otter must be careful of; these include coyotes, bears, bobcats, and wolves. Their life span is normally about nine years in the wild and twenty one years in captivity. Its fur color is usually grey and white or brown and black. The North American River Otter has a thick beautiful coat of fur that protects it from the cold and that is water-repellent. A sad fact is that this beautiful fur has made it a target of hunters for centuries. Its streamlined elongated body allows it to effortlessly glide through water. The otter has long whiskers used for feeling objects both on land and in the water. This creature has short legs and a thick muscular neck. These creatures weigh between 11 and 31 pounds (5 to 14 kilograms). The average weight of males is 25 pounds (11.3 kilograms) and 18 pounds (8.3 kilograms) for females. The length of their body ranges from 26 to 42 inches (66 to 107 centimeters). This Otter has a tail that ranges from 12 to 20 inches (30 - 50 centimeters) long. The North American River Otter has sharp teeth used to kill prey and large molars used to crush hard objects such as shells.